The weather looked interesting enough this afternoon that the family and I decided to make a quick trip to Auburn to check out No Hands Bridge at sunset. My wife took the kids for a walk across the bridge while I scurried down the hillside to find a composition. 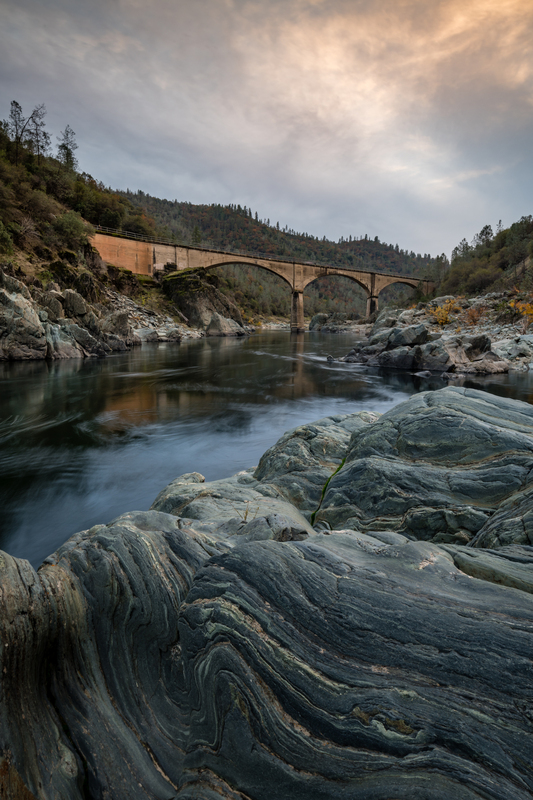 I found this rock with an incredible pattern to put in the foreground, and with the river leading you to the bridge, I just needed a nice sunset to bring it all together. I didn’t end up getting a colorful sunset as some high fog blocked the last light, but still an interesting shot. This photo was one of those rare occasions where I used the tilt function of my 19mm tilt shift lens (2mm down in this case). Rather than trying to focus stack a final image, I simply changed the focus plane to include the foreground rock and background bridge. I used a polarizer to take some of the glare off of the water and a 3 stop GND to bring down the brightness of the sky.